Took a little break from these posts lately as I’ve been quite busy these past few weeks… So much to catch up on! 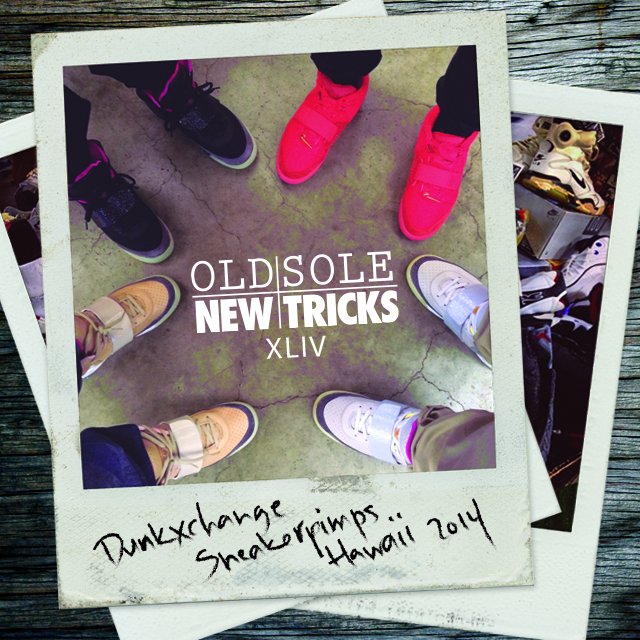 Good seeing some of you at the Dunkxchange x Sneaker Pimps Hawaii 2014 event… It’s always a pleasure talkin’ sneakers with all of you in person. Seen some good deals down there so I hope everyone was able to score something nice! It was great to be reminded that the Hawaii sneaker community is strong… Lets keep that going while helping each other learn, grow, and most importantly, have fun! Shouts to @electricbamboo, @seeshels, and all their camp who displayed my favorite section of the event in the back corner behind the futsol games… Wish I coulda took home a lot of those OG runners! Shouts to all the other homies, John from @truesthawaii, Cavet, Lofa, and all the @lightsleepers and Crappy Kids camp, Mayor @ronald808 and the rest of the @hawaiisneakerheads crew, Elmer (@tfhh_ebjr), Gil (@tfhh_gilbert), and the rest of The Firm boys, Ian, @mykexknows, @b_ryan, and the @paradise_drive crew, all the SGHI homies, Max and the rest of @paradisesoccerclub, my @nmlshi homies, @ayoitsfjcruz, @dukininam, @emagdam33, and all the #wahbap homies, @beard_xi, @rkauhane, @erictakaba, @cfujifilms, @cheeeepono, @jaycid_, @irockmykicks, @took_hnla, my camera guy, Jerry, and everybody else who supports the culture… Please don’t feel left out if I’ve missed you; it’d be impossible for me to catch everyone! Special shouts to my @fittedhawaiihunters family who represented well! Much thanks and respect! Also, got to kick it with @trinidadjamesgg for a bit and had the pleasure of attending his video shoot for a future CAMP JAMES 1st and 15th episode… Dude is mad cool in person; down to earth and humble. Respect. Last but not least, shouts to my dudes @dunkxchange, @sneakerpimps, @kidcurty, @dxcceo, and @chedda_bob619, who continuously bring down the event and recognize that Hawaii sneaker love is real… Enjoy the vid! Old Sole New Tricks – Dunkxchange from Pan + Tilt on Vimeo.